Previous articleAZ09, AZ07: The Suspense is Terrible. I Hope it Lasts. 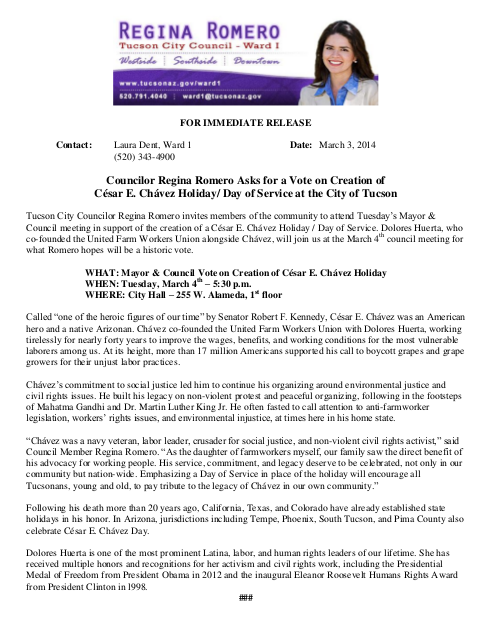 Tucson City Council listened to several speakers in support of this holiday: Chair of the Cesar Chavez Coalition Cam Juarez (TUSD Governing Bd. member), UA Prof. Roberto Rodriguez, Clarence Boykins (Tucson So. AZ Black Chamber of Commerce), MoveOn activist Alexandro Chavez (grandson), UFW activist Delores Huerta. Motion made by Councilmember Romero, 2nd by Councilmember Fimbres, motion passed 7-0. Chavez was born on March 31, 1927 in Yuma, AZ and passed away at age 66. Holding the Center, or Abandoning Hope?